Did you know that strawberries are one of the most effective fruits, rich in Vitamin C, bursting with powerful antioxidants, liked by children and adults? Beauty benefits of strawberries are numerous, from skin protection to teeth whitening. You can cut them into big slices and put them under your eyes for about 15 minutes to reduce under-eye puffiness. Strawberries contain the best ingredients for face mask which is very effective and can do many wonders in skin repairing. You can whiten your teeth naturally with powerful toothpaste made from strawberries and baking soda, or apply them directly on your teeth by rubbing half a strawberry back and forth all over your teeth and rinse off. Strawberries are great for hair, they protect your hair from hair falling or thinning, fight with dandruff, control the growth of fungus on your scalp and promote hair growth due to ellagic acid, copper, magnesium, and manganese found in them. Natural conditioner is always the best solution for the beautiful hair. Strawberries are the gift from the nature for the silky shine of your hair. 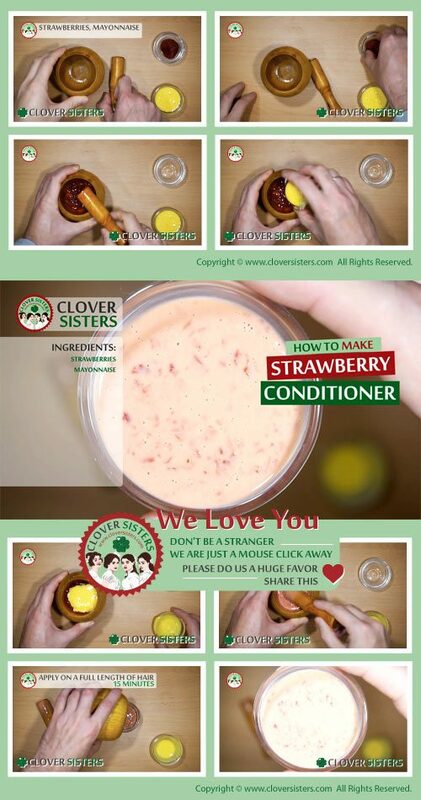 Blend few ripe strawberries with some mayonnaise into a paste. Apply on a full length of hair and cover with a plastic wrap for 15 minutes. Wash your hair normally after.